Elk Studios was founded in 2012, and they are currently concentrating on establishing themselves as the experts in mobile casino games. They prefer quality over quantity, which is why they may not have very many games to choose from, but what you do have is outstanding. This hasn’t gone unnoticed, and has quickly been appreciated by online slot players, and their investment in technology mirrored with their passion for beautifully designed games should make this games developer a name to keep an eye on. To read more about our promotions click here. 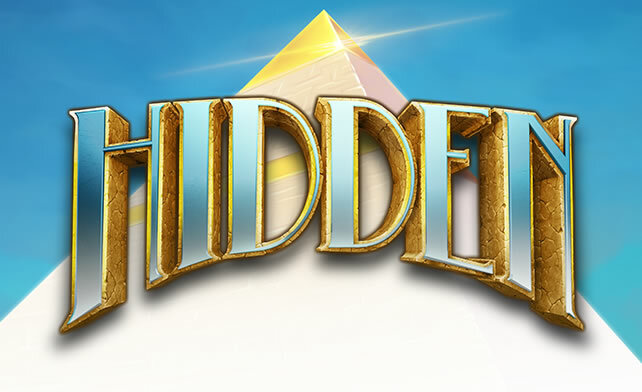 Hidden is more than just an ancient Egyptian themed online slot. You have the chance to travel back in time to the early 20th century and join the explorer and his young sidekick as they embark on an expedition to Egypt. The game opens up to a beautiful sequence with a full backstory for you to immerse yourself in. You can join in on this exploration adventure from as little as 25p up to a maximum of £100 per spin. You also have 5 reels and an impressive 178 paylines. Each symbol is encased in golden sandstone blocks with hieroglyphs, and they fall into place quite elegantly. In the background is an ancient tomb which you will be exploring on a beautifully clear day. On the reels you will find your traditional card playing symbols of 10, J, Q, K and A which make up the lower value symbols as they appear the most often. 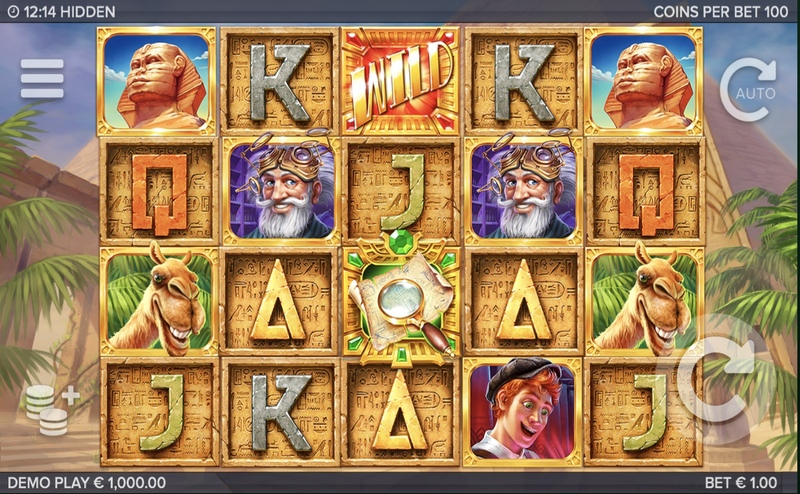 Your higher value symbols are represented by the Sidekick, the Bearded Explorer, a Grinning Camel and the Sphinx’s Head. The Wild symbol is a bright red and gold ‘Wild’ symbol. This will substitute for all other symbols except for the Magnifying Glass Scatter to help you for winning combinations as you spin your way through your adventure. The Treasure Room Free Spins is activated when you land the Magnifying Glass Scatter anywhere on the 2nd, 3rd and 4th reel. You will receive 5 Free Spins, and before the feature starts a symbol is picked at random. On each spin any of those symbols will turn themselves into large 2x2 icons with the original one in the top left, all other symbols will then fall away to allow new ones to drop in, hopefully more of the chosen symbol will fall into place further increasing your rewards. In addition, any magnifying glass scatters landing during this round will award one extra spin. This occurs at random in the main game and you will be awarded 3 Free Spins with one complete reel full of Wild symbols. Get a free spins if you pay by mobile, find out more. If you love an ancient Egyptian theme set in the early 20th century you will love this game, it is beautifully designed with the most stunning graphics and animations. It also comes with an excellent backstory to keep you entertained as you spin away. You’ll enjoy the bonuses, especially the Treasure Room Free Spins feature and this online new slot games comes with a RTP (Return to Player) of 96.30%. An equally crazy game is our Lucky LeprechaunSlots Game.